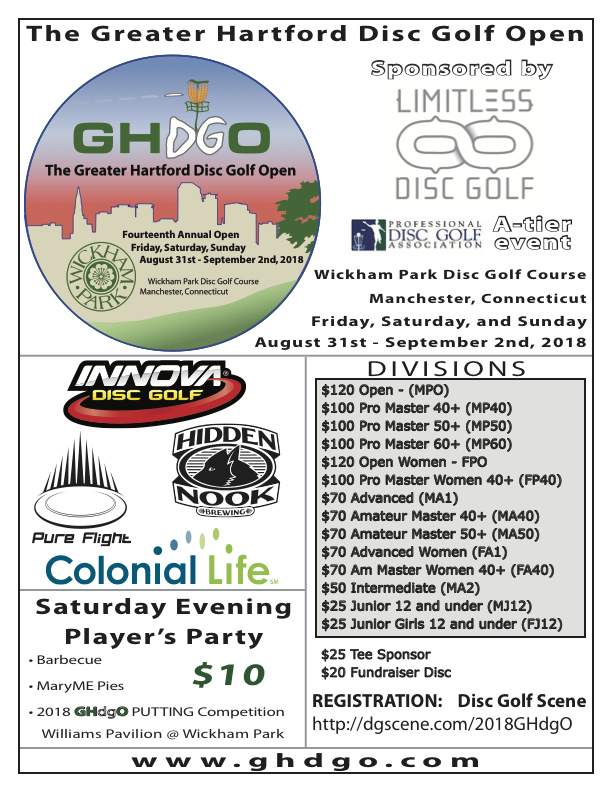 The Greater Hartford Disc Golf Open (GHdgO) is a Professional Disc Golf Association (PDGA) sanctioned A-Tier tournament hosted at Wickham Park in Manchester, Connecticut. The fourteenth annual tournament in 2018 transpires on Friday, Saturday, and Sunday on August 31st – September 2nd. Players in each division will compete on same layout for all three of the 22 holes rounds. Spectators are encouraged to attend to enjoy viewing the skills of world class professional disc golf players, and to enjoy the offerings of Wickham Park.